Albert Einstein is often quoted as saying, “God doesn’t play dice with the universe,” as if that meant that he believed in an invisible Heavenly Father taking an interest in our affairs. This longer quotation reflects his actual opinion. Some columnist on redstate.com referred to Richard Dawkins as “mediocre science writer.” Ha! Far from being just a science writer, Richard Dawkins has two doctorate degrees in Zoology, has been a lecturer in Zoology at the University of California, then a “reader” (professor) of Zoology at Oxford University. He was Professor for the Public Understanding of Science at Oxford until 2008, when he retired to concentrate on writing. His area of specialization is Ethology, or the evolutionary basis of animal behavior, and he studied under Nikko Tinbergen, one of the great researchers. Dawkins gives lectures at universities and events around the world. His written and spoken work has also earned him multiple honors and awards including honorary doctorates from the University of Durham, the University of Hull, Open University, Vrije Universiteit Brussel, the University of Westminster, the University of St. Andrews and the Australian National University. He was elected as a Fellow to the Royal Society of Literature in 1997 and to the Royal Society (the U.K.’s top scientists) in 2001. For his science, he has received, the International Cosmos Prize for contributing to the understanding of ecology (1997), the Kistler Prize for contributing to the understanding of human genetics and human society (2001), and the Medal of the Presidency of the Italian Republic (2001). He has won several significant awards for his writing and communicating science. In 1989, he won the Zoological Society of London Silver Medal for contributions to the understanding and appreciation of zoology. In 1990, he received the Michael Faraday Award for presenting physics in understandable form to the general public. In 2002, he won the Kelvin Medal of The Royal Philosophical Society of Glasgow, for presenting the appeal and excitement of physics to the general public. In 2006, he won the US-based Lewis Thomas Prize for Writing about Science. In 2007, he was the Galaxy British Book Awards’ Author of the Year. Time magazine named him one of the 100 most influential people in the world in 2007. In 2009, he won the Nierenberg Prize for Science in the Public Interest. If that’s their idea of a mediocre science writer, I want to be one, too! LOLscientists-OswaldAvery, originally uploaded by monado. 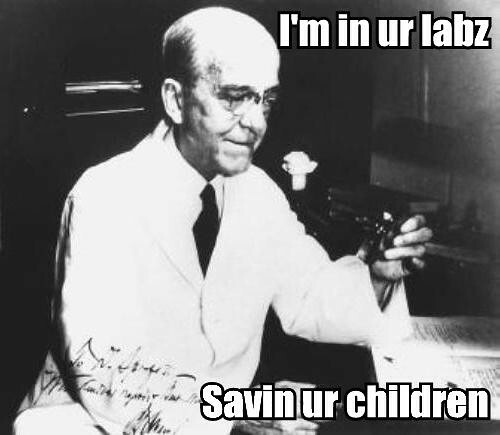 Oswald Avery was just one of the thousands of workers who devoted their lives to fighting diseases. He also proved that DNA, not protein, was the transmitter of genetic information.